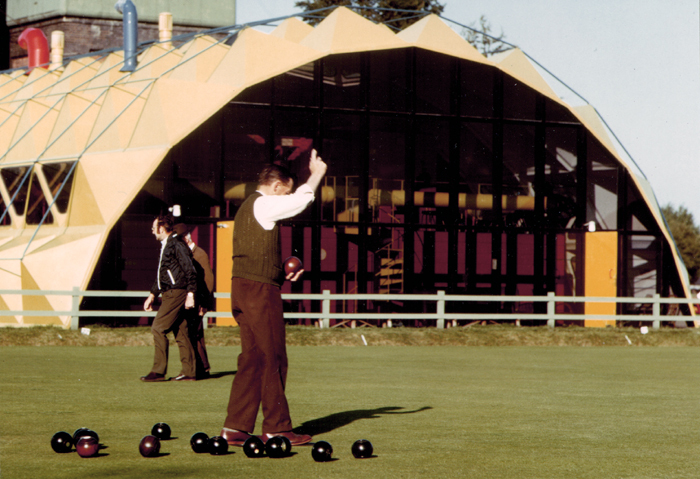 When ‘Wolverton Sports Club’ approached ‘Milton Keynes Development Corporation’ for help for a new sports pavilion to replace their rotting wooden one, they were offered the services of Swiss architect ‘Pierre Botschi’, who was experimenting with fibre glass structures. His design for a pavilion to house members of the cricket, tennis and bowls clubs was brilliant yellow in colour and its shape was summed up in its nickname – ‘The Pineapple’. Although the large window at one end overlooked the ‘Bowls Club’, their members decided to stay put in their converted railway carriage. Unlike normal cricket pavilions, with a balcony overlooking the pitch, this pavilion had no entrance, pitch side. Its high internal roof meant large heating bills, which the club tried to pay for with discos, but the noise annoyed local neighbours. The club returned, dissatisfied, to the Development Corporation, and they agreed to replace the ‘Pineapple’ with a more conventional brick structure. The old yellow pavilion was sold to a chicken farm in Somerset.Have you memories of the Pineapple? Please contribute them below. Grew up in Osborne Street and dad (Martin Smith) was always involved and did alot of the internal works. Never forget the night he chased burglars off the roof. Funny we ended up as neighbors to Roger (author) who’s chickens I tended when he was on holiday. As a youngster growing up in Wolverton I remember the excitement of the Pineapple Club being built next to the Cambridge Street tennis courts. Older residents thought it was a monstrosity and yes I do remember there were problems with residents complaining about the noise, but us teenagers in the 70’s thought it really was the coolest place to be seen! (Much better than the boring youth club)..
A ‘first date’ initiated from a Valentine’s disco held at the Pineapple Club, on 14th Feb 1974 led on to us being married in 1978. Does anyone know the location of the chicken farm? It would be lovely to know if it is still there. The high ceiling of the pineapple enabled us to play badminton during the winter months. My house overlooked it. The bright colour always cheered me up.